After 22GB of data usage, AT&T may slow speeds. Unlimited Talk, Text, and Data After 22GB of data usage, AT&T may slow speeds. Already an AT&T wireless customer? AT&T covers more than 99% of Americans and runs on the nation’s largest network. * With unlimited talk, text, & data and $0 down on smartphones^, AT&T has something for everyone. *Based on overall coverage in U.S. licensed/ roaming areas. Map estimates coverage. Compatible device req’d. Coverage not avail. everywhere. *As compared to other major subscription TV cable providers. Claim based on 2017 ACSI survey of customers rating their own TV provider's performance. ^To access HD programming, HD television required. Number of HD channels varies by package. ENTERTAINMENT ALL INCLUDED PACKAGE: Ends 6/30/19. Available only in the U.S. (excludes Puerto Rico and U.S.V.I.). 1st & 2nd year Pricing: $40/mo for first 12 mos. only. After 12 mos. or loss of eligibility, then prevailing rate applies (currently $93/mo. ), unless cancelled or changed prior to end of the promo period. Pricing subject to change. $5/mo. discount: Must enroll in autopay & paperless bill within 30 days of TV activation to receive bill credit starting in 1-3 bill cycles. First time credit will include all credits earned since meeting offer requirements. Must maintain autopay/paperless bill and valid email address to continue credits. No credits in 2nd year for autopay & paperless bill. Includes: ENTERTAINMENT All-Included TV Pkg., monthly service and equipment fees for one Genie HD DVR, and standard pro installation. Exclusions: Price excludes applicable use tax expense surcharge on retail value of installation, custom installation, equipment upgrades/add-ons (min. $99 one-time & $7/mo. monthly fees for each extra receiver/DIRECTV Ready TV/Device), and certain other add'l fees & charges. Different offers may apply for eligible multi-dwelling unit customers. ULTIMATE ALL INCLUDED PACKAGE: Ends 6/30/19. Available only in the U.S. (excludes Puerto Rico and U.S.V.I.). 1st & 2nd year Pricing: $60/mo for first 12 mos. only. After 12 mos. or loss of eligibility, then prevailing rate applies (currently $135/mo. ), unless cancelled or changed prior to end of the promo period. Pricing subject to change. $5/mo. discount: Must enroll in autopay & paperless bill within 30 days of TV activation to receive bill credit starting in 1-3 bill cycles. First time credit will include all credits earned since meeting offer requirements. Must maintain autopay/paperless bill and valid email address to continue credits. No credits in 2nd year for autopay & paperless bill. Includes: ULTIMATE All-Included TV Pkg., monthly service and equipment fees for one Genie HD DVR, and standard pro installation. Exclusions: Price excludes Regional Sports Fee of up to $8.49/mo. (which is extra & applies in select markets to CHOICE and/or MÁS ULTRA and higher Pkgs. ), applicable use tax expense surcharge on retail value of installation, custom installation, equipment upgrades/add-ons (min. $99 one-time & $7/mo. monthly fees for each extra receiver/DIRECTV Ready TV/Device), and certain other add'l fees & charges. Different offers may apply for eligible multi-dwelling unit customers. 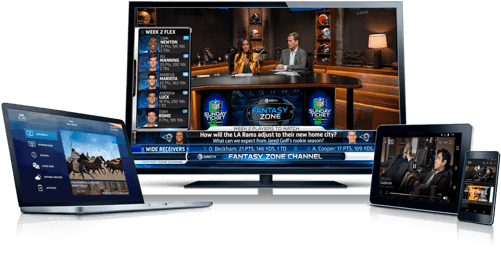 DATA FREE TV: Residential DIRECTV & select wireless customers in the U.S. (excludes PR and U.S.V.I.). In-App streaming does not count against your data allotments. Exclusions apply & may incur data usage. Will receive Bonus Data to help cover data usage for exclusions. Elig. Wireless: Requires active AT&T postpaid data service on elig. device. Use subject to wireless service terms including those related to data speed. Streaming may not work at reduced speeds. Offer, functions & programming subject to change & may be discontinued without notice at any time. See att.com/datafreetv for details. WIRELESS SVC TERMS: Subject to Wireless Customer Agreement (at att.com/wca). Credit approval, charges, & restrictions apply. Coverage and services not available everywhere. See att.com/broadbandinfo for AT&T's network management practices. Subject to change and may be modified or terminated at any time without notice. See full terms at att.com/wirelessterms. DIRECTV SVC TERMS: Subject to Equipment Lease & Customer Agreements (at directv.com/legal). Pro-rated Early Termination fee (up to $480) and Equipment Non-Return and other fees and conditions apply. Programming, pricing, terms and conditions subject to change at any time. $0 DOWN: Req’s well-qualified credit. For smartphones only. Tax on sales price due at sale. Req’s AT&T Next or AT&T Next Every Year installment agmt. Divides sales price into monthly installments. Limit as low as 2 smartphones at $0 down. Service: Eligible postpaid voice and data service (minimum $45 per month after AutoPay and Paperless billing discount for new customers. Pay $55 per month until discount starts within 2 bills. Existing customers can add to eligible current plans which may be less) is required and extra. If svc is cancelled, remaining installment agmt balance is due. Activ./Upgrade Fee: $30/line. Restocking Fee: Up to $45. Limits: Eligibility, device, line and financing limits & other restr’s apply. See att.com/next and your Retail Installment Agreement for full details. ROAM NORTH AMERICA FEATURE: Allows plan data, talk & text usage. Data: Allows domestic plan data usage in Mexico/Canada. Off-net (roaming) data may be at 2G speed. Talk: Phones only. Includes calls within Mexico/Canada and from Mexico/Canada to the U.S., Puerto Rico, and U.S. Virgin Islands (collectively with Mexico & Canada, the North America Coverage Area “NACA”). You may be charged for calls to special or premium service numbers. Calls to other countries: International long distance pay-per-use rates apply to calls from Mexico or Canada to countries outside NACA unless have an ILD service package. Rates subject to change w/o notice. For rates, see att.com/wcv. Text: Standard Messaging – Phones only. Includes unlimited messages up to 1MB in size within Mexico/Canada & from Mexico/Canada to more than 190 countries for text messages and 120 countries for picture and video messages. AT&T may add, change, & remove included countries at its discretion w/o notice. Messages sent through applications may incur data or other charges. Visit att.com/text2world for details. Advanced Messaging not available for use in Mexico or Canada. Usage Restriction: If voice, text or data use in Mexico and/or Canada exceeds 50% of total voice, text or data use for two consecutive months, feature may be removed or roaming speeds may be permanently slowed to 2G speeds. Restrictions: Service not available on select connected devices, wearables & connected cars. WATCHTV: Can be added to &More Premium plan. To add you must create account at attwatchtv.com/verifywatchtv, verify your wireless account, & then can access through WatchTV app or compatible browser. May require verification via text msg. Req’s compatible device (sold separately). Use of WatchTV is subject to its own terms & conditions, see attwatchtv.com/terms-and-conditions for details. Included channels, programming & content subj. to change & benefit may be terminated. Lost Eligibility: Upon cancellation of elig. wireless plan you may lose access to WatchTV. Limits: Access to one WatchTV acct. per elig. wireless acct. Limit 1 concurrent stream with WatchTV. May not be stackable w/ other offers, credits or discounts. Includes usage only in the DCA. CHOOSE ONE: Eligible customers can add to AT&T Unlimited &More Premium for no extra charge. Use only in the DCA. Must create account at attwatchtv.com/verifywatchtv, verify your wireless account, & then can select your one add-on. Music apps may not be available to customers in Puerto Rico & the U.S. Virgin Islands. May require verification via text msg. Requires compatible device (sold separately). May require acct. creation and acceptance of third-party terms and conditions for certain add-on choices. Access to add-on is for 12 months; then may select new add-on option for next 12 months. If you have an eligible AT&T TV service (DIRECTV NOW residential DIRECTV or U-Verse) your premium movie channel selection will also be added on that TV platform. May be billed and then credited on that TV platform within 2 bills. Customers in Puerto Rico & the U.S. Virgin Islands, as well as Single Billing or Bulk MDU customers only have access to premium movie channel selection on WatchTV app. Included channels, programming and/or content subject to change and benefit may be terminated. Lost Eligibility: Upon cancellation of elig. wireless plan you may lose access. Limits: Access to one add-on per elig. wireless account. May not be stackable w/other offers, credits or discounts. Offers, programming, pricing, channels, terms & restrictions subject to change and may be discontinued at any time without notice. DIRECTV: Subj. to Equip. Lease & Customer Agreements (directv.com/legal). New approved or existing residential customers. Residents of select multi-dwelling units are not eligible. Must maintain a min. base TV pkg of $29.99/mo. ($31.99/mo for Puerto Rico). Hardware and programming avail. separately. If new customer, 24-month agmt & equipment lease req’d. Must be installed w/in 30 days. EARLY TERMINATION FEE OF $20/MO. (FOR PUERTO RICO & U.S. VIRGIN ISLANDS $10.42/MO.) FOR EACH MO. REMAINING ON TV AGMT, ACTIVATION UP TO $35, EQUIPMENT NON-RETURN & ADD’L FEES APPLY.Credit card req’d (except MA & PA).See att.com/directv or call for details.